There are now more than 500 million devices in US homes connected to the Internet. Furthermore, the average number of devices per US Internet household has grown from 5.3 devices just three months ago to 5.7 today. The firm apparently refers to “apps” as software in general, as opposed to devices with access to an app store. While I would normally refer to gadgets with apps as anything running Android, iOS, BlackBerry, Windows 8, or Windows Phone, it’s clear the term has expanded to almost any device that a consumer can buy, but I digress. 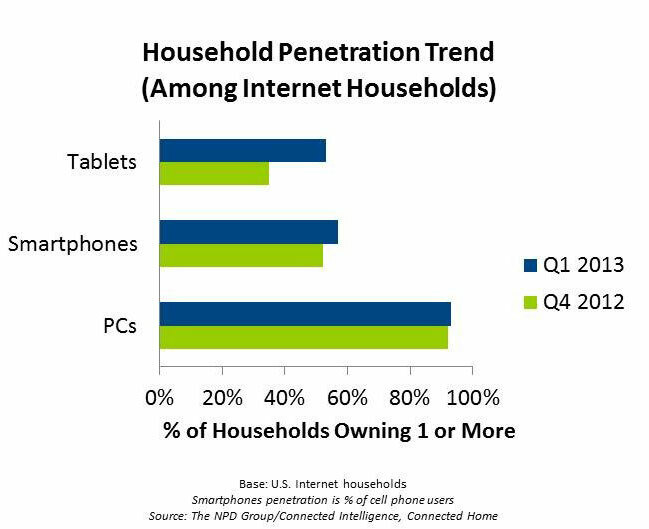 NPD says PC penetration among US Internet connected households this quarter is “nearly ubiquitous at 93 percent” but was “virtually unchanged” over the last quarter. An increase in mobile devices naturally helped the US market to hit the new milestone: smartphone penetration rose from 52 percent to 57 percent of cell phone users while tablet penetration increased significantly from 35 to 53 percent of Internet households. Converting those percentages into raw numbers, the install base of smartphones increased by some 9 million while tablets gained nearly 18 million in the last three months. Unsurprisingly, Apple and Samsung remained the most prevalent smartphone brands owned by US consumers, and Apple continued to dominate the tablet market.